A federal court in California has blocked the sale of Samsung’s Galaxy Tab 10.1 tablet in the U.S. in a patent dispute between Apple and Samsung. Samsung intends to appeal. The patentrefers to the ornamental design of the device. The court previouslyfound the Galaxy Tab 10.1 to besubstantially similar “in the eyes ofthe ordinary observer” to the D’889, the Judge said. It noted that theGalaxy Tab 10.1 is “virtually indistinguishable” from Apple’s iPad andiPad 2, she added. A California judge says theSamsung Galaxy Tab 10.1 (above) is “virtuallyindistinguishable” from Apple’s iPad. Apple has been ordered to post a bond for US$2.6 million towards anydamages sustained by Samsung if it is later found to have beenwrongfully enjoined, Judge Koh said in her eight-page order. 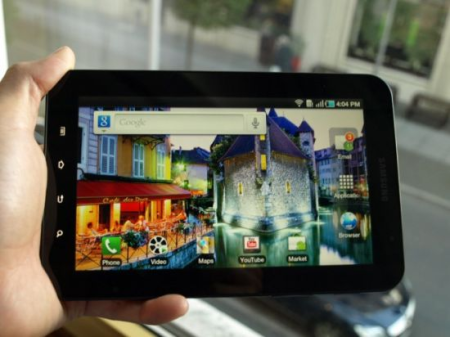 The maker of the iPad tablet and other iconic devices filed in Julylast year for a preliminary injunction against the Galaxy Tab 10.1tablet, which had been released about four months earlier, as well asseveral Samsung smartphones. It allegedthat Samsung had infringed theD’889 patent, as well as a utility patent. In a December 2, 2011 order, Judge Koh found that Apple had establishedthat the Samsung Galaxy Tab 10.1 likely infringed upon the D’889Patent, and that Apple was likely to suffer irreparable harm as aresult of Samsung’s infringing conduct. However, the court denied thepreliminary injunction because the D’889 Patent was likely invalidbased on several prior art references. The Court of Appeals for the Federal Circuit upheld District Court’sfindings of infringement and irreparable harm with respect to the D’889Patent, but reversed the court’s invalidity finding as to the patent,Judge Koh said in her order on Tuesday. Related Story | Apple tries to block S III phones in U.S. The appeals court remanded to the District Court to assess the balanceof hardships and public interest factors. This District Court finds that the balance of hardships tips in Apple’sfavor, in the light of the Federal Circuit’s ruling that Samsung hasnot raised a substantial question as to the validity of the D’889Patent, Judge Koh said in her order. Samsung was not immediately available for comment on the order. JudgeKoh’s order becomes effective as soon as Apple posts the bond. The company has meanwhile filed noticewith the court that it intends to appeal. Apple, infringe, ipad, Patent, sale, Samsung, u.s.